Harrington Industrial Plastics and FGI Corporation recently outfitted and installed a sea lion attraction at the Aqua Theater in the Wildlife Conservation Society’s Queens Zoo with EXTREN® fiberglass structural shapes and DURADEK® I-6000. 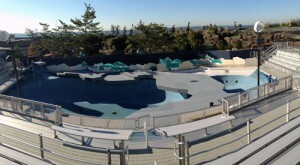 The above pool theater was previously shared amongst dolphins and pinnipeds, but recently the structure was completely redesigned to exclusively showcase sea lions. The previous stage consisted of a wooden walkway which separated two pools. After Super Storm Sandy hit, the aquarium worked with design engineering firm Dunne & Markis Consulting to design a new setup utilizing Strongwell’s fiberglass. Dunne & Markis Consulting, with the assistance of Harrington Industrial Plastics, chose fiberglass over traditional materials due to varying corrosion issues resulting from the location of the job site. The aquarium is situated near the ocean and its structures are constantly subjected to seawater and brackish water. 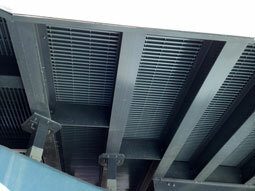 This naturally corrosive environment quickly corrodes steel, aluminum and even stainless steel. The other option is wood, which becomes brittle and weak after exposure to sun and saltwater. Fiberglass is highly resistant to these corrosive elements. In addition to the stage structure, EXTREN® structural shapes were fabricated to create sea lion stands. These stands are subjected daily to saltwater and the weight of sea lions, which can weigh up to 500 lbs. each. Aquarium representatives said the fiberglass structure, stage and seal stands look and function above expectation and should provide multiple years of safe and durable performance. Representatives also commented on the tremendous support they received from Harrington Industrial Plastics to make this project a complete success. Note: This project received a 2013 Merit Award from ENR New York in the Sports/Entertainment category.